Compliance with the so-called greening requirements is a condition for the receipt of the full direct payments under the EU’s Common Agricultural Policy (CAP). A key element of the CAP reform is the designation of “ecological priority areas”, which most farms have to identify within their agricultural areas. Our TalkingFields Service for Greening supports you in finding the optimal ecological priority areas according to economic and ecological criteria. With the help of the TF Yield Potential Map and spatial information about natural or near-natural landscape features, our service can identify buffer strips of your arable land, which have a low yield potential and at the same time make a high contribution to biodiversity as they border on existing habitats. 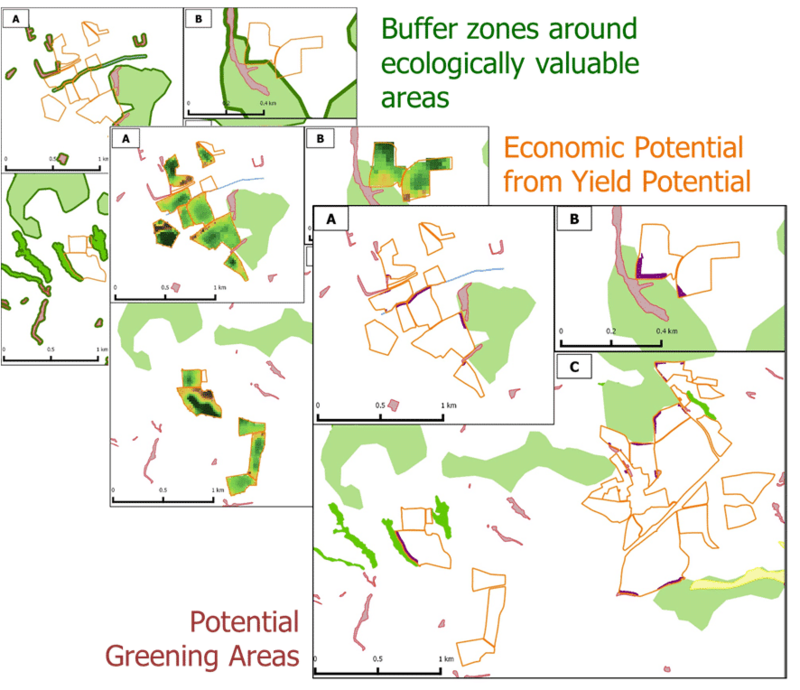 The combination of (1) natural or near-natural landscape features with (2) the TF Yield Potential Map shows the arable areas that are particularly suitable for designation as “ecological priority areas” according to the CAP Greening Ordinance. The TF Yield Potential Map shows the average potential yield of a selectable crop in t/ha with knowledge of local climate, soil conditions and topographical situation. For the TF Yield Potential Map, the potential yield over several years is calculated using a crop growth model (PROMET) resulting the mean value over all years.Thus, the influence of different weather conditions is minimized, and the calculated value is representative. Via the TF Base Map, the simulated potential yields are then transferred to the detailed site-specific TF Yield Potential Map. .de now also provides the latest weather forecast! Follow the >Weather Link for a highly informative visualization. Base Map can now also be ordered and integrated directly using the new NEXT application data center!